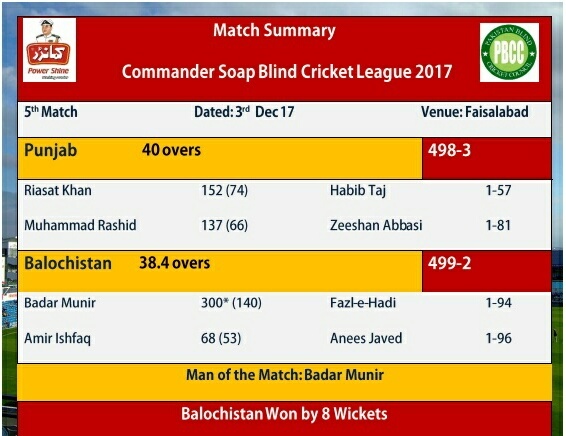 Badar’s heroic triple century helped Balochistan to qualify for the final of Commander Soap Blind Cricket League. Badar Munir, who has been in the sublime batting form in this season, played another blinder. He scored 299 runs in the recent NBP T-20 Trophy last month and carried forward his awe-inspiring batting form in One-day format event as well. He scored double century in the opening game of this event just couple of days ago but his best has yet to come. Today, till the afternoon, most of the people who had been following the Blind Cricket League in Faisalabad never had thought that the target of 499 runs in 40 over could be achieved. The highest target achieved in the Blind Cricket was 443 runs so achieving almost 500 runs in 40 overs was next to impossible. But Badar’s bat made the impossible, quite achievable. His unbeaten 300 runs in the Blind Cricket is the highest runs by an individual in One-day matches. He scored triple century off just 140 balls and helped his side to chase the target of 499 runs in 38.4 overs with 8 wickets and 8 balls to spare. Amir Ishfaq supported him with 68 runs. Fazal-e-Hadi and Anees Javed claimed a wicket apiece. In the morning, Punjab won the toss and opted to bat first. Punjab batsmen hammered the Baluchistan’s bowlers and posted a mammoth total of 498 runs for the loss of 3 wickets in allotted 40 overs. Riasat Khan was the star, he made 152 runs and Muhammad Rashid scored 137. Zeeshan Abbasi and Habib Taj took one wicket each. Sindh won the toss and asked KPK to take guard. KPK posted 334 runs on the board for the loss of 7 wickets in stipulated 40 overs. Muhammad Jameel was their highest run getter with unbeaten 105 runs off 80 balls while Mati Ulllah scored 68 runs. Haroon took 2 wickets while Waqas, Rahid Ullah and Saqib shared a wicket a piece. In reply, Sindh didn’t make the most of opportunity given by their bowlers to restrict KPK on comparatively low score. Sindh managed to score 318 runs in stipulated 40 overs for the loss of 9 wickets. Muhammad Arsalan scored 78 and Haroon Khan chipped in with 55 runs. Israr Hasan was the pick amongst the bunch he took 1 wicket, rest of the players were run out. After the completion of the round robin, three (3) teams Balochistan, KPK and Punjab had equal (6) points as they had won the same number of matches. Balochistan and Punjab having the better net run rate advanced to the final. The Final of the tournament will be played on Monday (tomorrow) at Iqbal Stadium Faisalabad.